Hippos captain Shaban Muhammad battles with Lesotho defender Monaheng Rama. Courtesy photo. FOOTBALL–Lesotho will face South Africa in the finals of the 2017 COSAFA U-20 Championship on Saturday after eliminating Uganda. The development was confirmed on Thursday evening after the two semi final matches played at the Arthur Davies stadium in Kitwe. A 10-man South African side won 1-0 over Egypt with Luvuyo Mkatshana scoring the lone strike 4 minutes to the half time break. 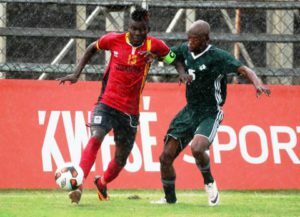 Uganda U-20 team bowed out in painful style, losing 6-5 in post match penalties to Lesotho in a rain laden fixture. This followed a goal-less draw in normal time. Frank Tumwesigye, Abdallah Kasule and team captain Muhammed Shaban got close to scoring for Uganda. In the tense shoot out, Geofrey Wasswa, Shafiq Kagimu, Julius Poloto, Pius Obuya and Allan Okello converted with success whilst Vipers’ midfielder Mujahid ‘Baden’ Ogama blasted his kick high of the goal posts. Uganda will now play Egypt in the third place play off match on Saturday before the main match of the tournament – the final, when South Africa takes on Lesotho. Lesotho will play in their third final after previous appearances in 1990 and 2005, but are seeking their first championship win. South Africa are five-time winners and could join Zimbabwe on six with victory in the final.